On saturday I published a blog about a small app I wrote called xSync – basically a XS Engine app for Mac developers where you can sync a local development folder with your HANA repository. This is for rapid development and to encourage the “bring your own IDE” approach to application development on HANA. Here is a look behind the scenes on how the app works and some of the challenges of the project. Using Firefox Rest Client to monitor system calls showed each save, create, delete operation was using a small file called reposervice.xsjs, which references the libraries needed for the repository modifications. 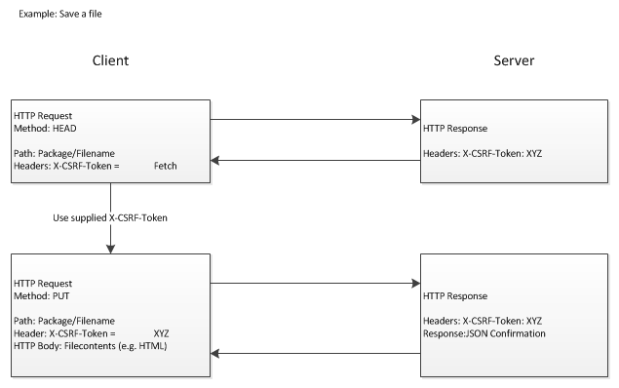 The diagram above displays the HTTP call made when saving/creating a file, and how the IDE initially does a HEAD request for the XSRF token, followed by the HTTP PUT. Once I had this done, I was wondering what the best integration option would be and weighed up a couple options of a simple check in type procedure, but wanted something faster, easier and “click free”. Being a bit of a highly iterative developer myself, I find it easier to develop “online”, which is why I decided it would be best to do a File System watch of a particular folder and save any changes automatically to my HANA instance. Similar to a dropbox type approach. I had my POC working nicely, a integration goal defined and set out to start developing the UI/Application in Objective-C (Xcode). I had a template type of app from one of my little SAP Note Viewer applications which could act as a foundation. I threw some code out and pulled some very useful little open source packages in as helpers. Within a couple hours in my evenings each night the app was running nicely and doing what I had expected, modify a file or two in a predefined location and sync up to XS. easy. If you are interested in incorporating some these types of features into your own app, I will be posting a copy of the integration classes on GitHub shortly. PLEASE KEEP IN MIND: This is exploratory type work with undocumented API’s, I would not recommend using this in production, or any important production work (or your important opensap homework!). The reason I shared this was to encourage people to look under the hood and understand the how’s and why’s of how some of these great new tools work. I would be interested to hear if anyone has any interesting use-cases for being able to manipulate both HANA repository and DB artifacts from outside of the Studio? Does anyone have any challenges with the HANA Studio today they would like to see changed?